This topic describes the metrics emitted by the metric namespace oci_vcn (the Networking service). Resources: virtual network interface cards (VNICs). Each Compute instance has one or more Networking service VNICs. 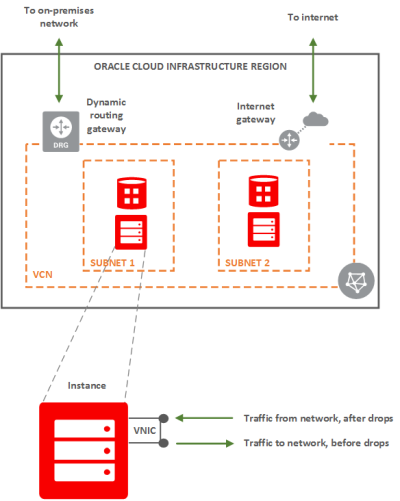 A VNIC connects the instance to a subnet in a virtual cloud network (VCN). 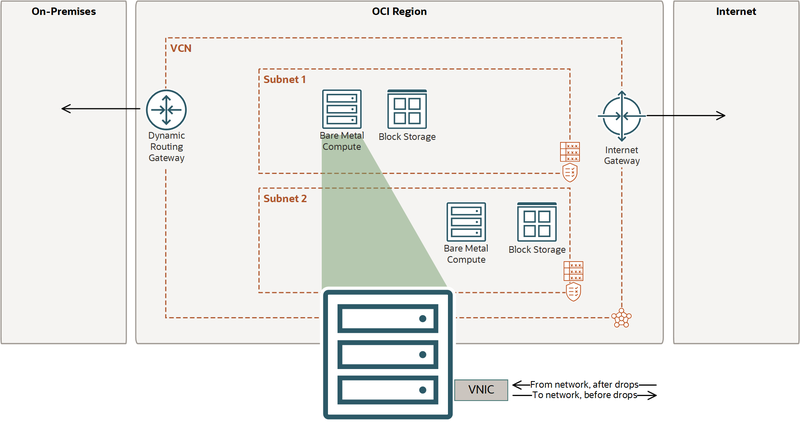 A given VNIC controls how the instance communicates with endpoints inside the VCN (other instances) and endpoints outside the VCN (hosts on the internet, in your on-premises network, in another VCN, and so on). The following diagram illustrates the general concept. A given instance resides in a subnet within a VCN that has one or more gateways to communicate with other networks. The instance is enlarged to show its VNIC, which the instance uses to communicate with the network. In this context, the term network means both the other instances in the VCN and hosts outside the VCN available through the gateways. The VNIC receives traffic from the network and sends traffic to the network. The Networking service drops packets according to security list rules you set up for the instance's subnet. Traffic coming to the VNIC from the network is measured after the Networking service drops the packets that violate the subnet's security list rules. Traffic leaving the VNIC is measured before the Networking service drops the packets that violate the subnet's security list rules. The Compute service separately reports network-related metrics as measured on the instance itself and aggregated across all the attached VNICs. Those metrics are available in the oci_computeagent metric namespace. For more information, see Compute Metrics. The VNIC and the VNIC's metrics (emitted by the oci_vcn metric namespace) reside in the subnet's compartment, and not the instance's compartment. The VNIC attachment (which is an object different from the VNIC itself) resides in the instance's compartment. If the instance and subnet are in the same compartment, these details aren't so important when you write the IAM policy. The following policy contains the one statement required to get VNIC metrics, which are part of the oci_vcn metric namespace. If you're using the Console, this policy lets you go to the Monitoring tab in the Console and view the metrics for one or more VNICs in the specified compartment. The policy uses an example group called VnicMetricReaders. The condition at the end (where target.metrics.namespace='oci_vcn') allows the group to view only the metrics in the oci_vcn metric namespace. The following policy lets you view an instance in the Console, click through to a specific VNIC, and then view that VNIC's details and metrics. The second and third statements let you view the instance's details and the VNIC's details, respectively. The metrics listed in the following table are automatically available for any VNIC on any instance you create. You do not need to enable monitoring on the instance to get these metrics for the VNIC or VNICs on the instance. An Oracle-assigned unique ID called an Oracle Cloud Identifier (OCID). This ID is included as part of the resource's information in both the Console and API. of the VNIC. Packets sent by the VNIC, destined for the network, dropped due to security rule violations. Packets received from the network, destined for the VNIC, dropped due to security rule violations. Bytes received at the VNIC from the network, after drops. Packets received at the VNIC from the network, after drops. Bytes sent from the VNIC to the network, before drops. Packets sent from the VNIC to the network, before drops. * The Compute service separately reports network-related metrics as measured on the instance itself and aggregated across all the attached VNICs. Those metrics are available in the oci_computeagent metric namespace. For more information, see Compute Metrics. Click the VNIC to view its details. For Compartment, select the compartment that contains the VNICs you're interested in. Remember that a given VNIC resides in its subnet's compartment. For Metric Namespace, select oci_vcn. If there are multiple VNICs in the compartment, the charts default to show a separate line for each VNIC. You can instead show a single line aggregated across all the VNICs by selecting the check box for Aggregate Metric Streams on the right side of the page.